Before you cry, "VANDAL!" let me point out that this hardback copy of Harry Potter fell to bits after being loved to death by our library borrowers. Pages falling out all over, irreparable. But not useless. Oh dear me no. Because every left hand page of the book has the header, "Harry Potter". The pages are a reasonable weight of paper. And the knowledge of Harry Potter among children is extensive. 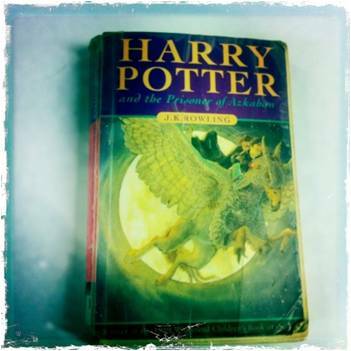 And J.K. Rowling created with these books a world and vocabulary that is highly recognisable. Character names, spell words, place names and more. 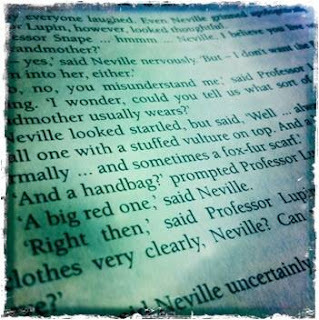 So if you take a page with Harry Potter as its header, and slice down either side to a bookmarky sort of size, you'll get, pretty much every time, some bit of recognisable vocab on the page (as well as the Harry Potter cue at the top). Lupin. Hogwarts. butterbeer. Expelliarmus. And you will also get a bookmark that kids like and which hasn't cost you a bean. And there are lots and lots of pages in Harry Potter books, so you have lots and lots of bookmarks which you can share generously and without a qualm. It's recycling and it's useful and fun. Tune in tomorrow for another cheap bookmark idea! 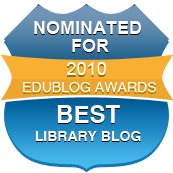 *GIFSL = good ideas for school libraries, an ongoing series on this blog. Wow Ruth, that is a FABULOUS idea! Thank you so much for sharing! What an excellent idea. I love it! Is it wrong to be anxiously waiting now for a Harry Potter book to fall apart??! Ruth : Thanks for the tips. I have actually taken a leaf from your book (pun intended) and used some of our older books for this very purpose. I am sure I read the idea here first so thanks a lot - as you know, the bookmarks are very popular!